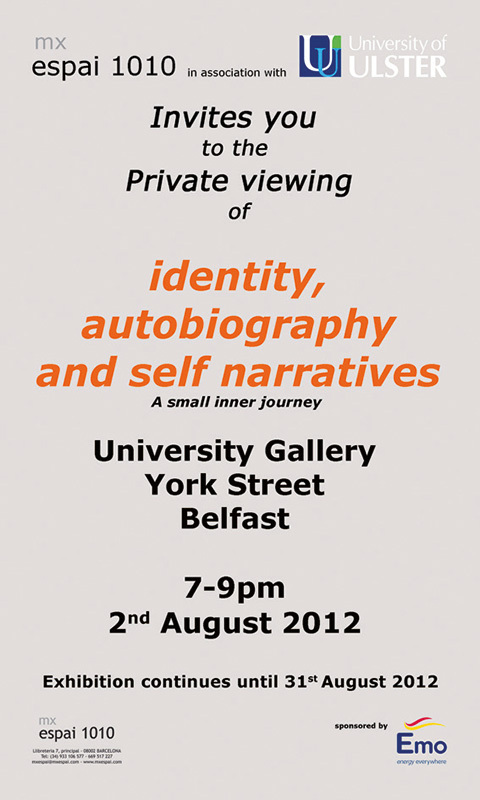 mx espai 1010 in association with University of Ulster invite you to a private viewing of the identity, autobiography and self narrative exhibition. When we presented our subject for the starting point of this edition of the Small Format Exhibition, we knew that the idea of self-narration would generate a stimulating inflection in the work of the artists it was addressed to. What we did not imagine at the time was that the number of works submitted was going to double and that we would be landed with the awkward task of choosing or discarding pieces of “life”. Our original statement said that “etymologically, autobiography means to write about our own life, to say something about the “me-itself”, about how we produce our identities when we write about ourselves or about the way we live our lives, proposing the difficult task of doing so in a minimal amount of space, to visualise that essence, fragment or tone that identifies us. We know that autobiography is a literary genre and that its correlative visual art is self-portraiture, but we feel that to spread the possibilities of representation over the full range of the context of narration has made it possible to generate works of greater richness and complexity. Much as portraits and biographies, self-portraiture and autobiography are historically akin. When the possible interpretations of biography became wider, the visual field of portraiture also grew, enabling a self-portrait by Rembrandt to acquire a complexity comparable to the literature of his time. However, despite some major precedents such as Saint Augustine, autobiography did not fully develop until Rousseau’s Confessions. It was in Confessions that a single text unfolded its full range, from intimate confidences to declarations of the author's own contradictions addressed to society at large, and it was not until the twentieth century that artists have generated a veritable catalogue of viable acts-of-representation in which what is private always takes place within a context. Atlas by Gerhard Richter, or the entire work of Louise Bourgeois, are magnificent examples. It is a pleasure for us to provide an opportunity for artists from all over the world to show their work in Barcelona. Since the First International Show of Small Format Contemporary Art up to the present time, we are happy to have received the works of over 300 artists from 50 different countries. Many participants, such as Ane Henriksen, Goro Nagano, Gyongy Laky, Hannelle Ollakka, Junko Suzuki, Yvonne Pacanofsky, Hideho Tanaka, Helga Borisch, 'Juan Pablo Muino" Carlos Martinez, Lone Villaume, Julia Tina Herchenroder, Maija Paavola, Marti Ribas, Aurelia Munoz, Hee Oh Myung, Akiko Kotani, Carmen de los Llanos, Ursula Gerber Senger, Yuu Izaki, Irene Pressner, Cecilia Postiglioni, Katharina Gun Oehlert, Marina Ramoneda, Yukimaro, Ade Boyle and Lourdes Penaranda, have had individual shows at l'MX Espai. Others, such as Ana Moreno, Chiharu Shinohara Chiharo, Carmen de la Calzada, Yusuke Ichihara, Goya, Yuu Izaki, Silvia Jopkin, Yumi Kasugai, Daniel Yacuvowich, Iwatsubo Mie, Nino Maza, Sachiko Morino, Linda Bejar, To Gallardo, Carme Porta, Hideho Tanaka, Tita Lunar, Hiroe Tanaka, Kinuyo Yoshimizu, Letizia Strigelli, Gabriel Ulmer, Janet Ledsham, Sandra Turley, Jytte Rasmussen, Lourdes Penaranda, Louise H. Berube, Yvette Heller/Gabriele Ulmer, Hiroe Nobuko, Susanne Neiss, Mireia Clotet, Helne De Ridder, Yolanda Dupuis, Anne Marie Egemose, M. Teresa Gomez, Marie­ Dominique Guibal, Hee Oh Myung, Rosemary House, Zuzana Kromadova, Ishi Kakuko, Raija Jokinen, Eva i Gabriella Kecseti, Patricia Bordoni, Cecilia Gutierrez, Moosa Myllykangas, Naoko Serino, Mari Kubo, Kyoko Kumai, Seija Laaksonen, Monica Loster, Yuki Kotayashi, Rosa Marti, Carme Sesplugues or Carol Westfall, have seen fit to keep us company on several editions and many have ben invited to participate in group shows. Likewise, about twenty of the artists that participated in the Third International Exhibition of Small Format Contemporary Art were selected to take part in the International Exhibition that was held at the Contemporary Art Museum of Chile, within the exchange and collaboration scheme promoted by MX ESPAI 1010. In a similar way, our Eighth International Exhibition of Small Format Contemporary Art went on to be hosted by the Galleria Esposta in Verona, Italy. Finally, we want to underline that IDENTITY, AUTOBIOGRAPHY AND NARRATIONS OF THE SELF, the 11th International Show of Small Format Contemporary Art intends to be a platform from which to broadcast the work of all the artists that have put their trust in the project of MX ESPAI 1010.